I spent several days last week with Florida friends who live at the beach. What a treat to walk out their front door, cross the street, go down some stairs and feel the delight of sand squishing between my toes and sea breeze ruffling my hair, with the mighty Atlantic Ocean in the background. For inspiration, it’s a close second to the Rocky Mountains! My friends told me an amazing incident that happened at a neighboring beach not long ago. Two young boys had been pulled away from the shoreline by dangerous riptides. Their mother and father had tried to rescue their sons, but had become trapped themselves by the powerful undertow. A quick-acting woman on the beach mobilized others to join hands and link arms. 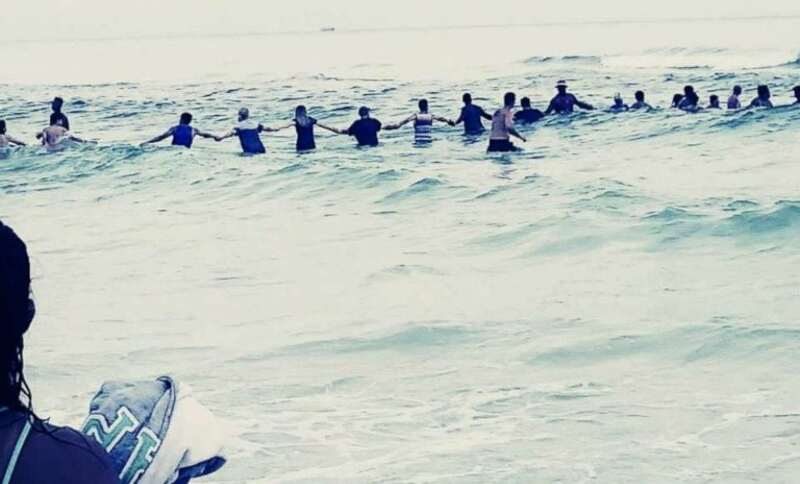 Essentially they formed a human chain, waded into the water and brought the whole family to shore safely. What one or two could not accomplish, the strength of a group of people pulling together could. Sometimes our lives are so busy we get disconnected and become vulnerable to the tides of change and chance. We drift. We struggle against unseen forces and find that even our best efforts don’t seem to bring us closer to where we want to be. There’s a reason one of the images of Christian community is a human body. We belong together. We are many, yet we are part of one whole. We were meant to live and love in relationship with others. Where in your life do you feel disconnected? God invites us to connect and re-connect with other people, to discover the strength and purpose possible when we join together. It can bring us life. Gracious God, you are our comfort and strength in peaceful seas and troubled waters. Grant us grace to seek connection and companionship with your people, to remember that we are one body, eternally loved and empowered to love. We pray in your name. Amen. If it’s been awhile since you gathered with a community of faith, join us for worship on Sunday, 10:30am. Or if it’s your practice to attend, notice others who might feel disconnected and extend a hand of welcome to them.